Happy October everyone! Well, fall is officially here and we have some fun things to tell you today. 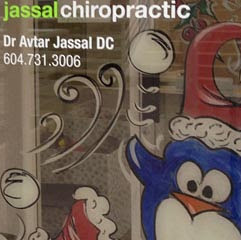 Firstly, Dr. Jassal is at the Vancouver Home Show at BC Place this weekend (11-14) offering complimentary spinal checks and computerized scans. We are also booking full exams with a food bank donation – this is a perfect time to get checked. Come over and say hi if you’re a patient! We have found a wonderful resource for parents called Well Adjusted Babies, a textbook which is normally found on Amazon for a couple hundred dollars. We have brand new copies available for purchase right now at only $40.00. They are going FAST! Also we would like to remind our current patients that there is a lending library at our office, and you can borrow books one at a time for up to 2 weeks. Just ask Natasha or Emma for details. Now that everyone is settled back in school, Dr. Jassal has decided to change up our adjusting and exam hours in the afternoons to accommodate all the families that are visiting us on the way home from classes each day. We encourage you to schedule these peak appointment times as far in advance as possible; they are filling up quickly. Please call us to book your appointment and we will be happy to help you.